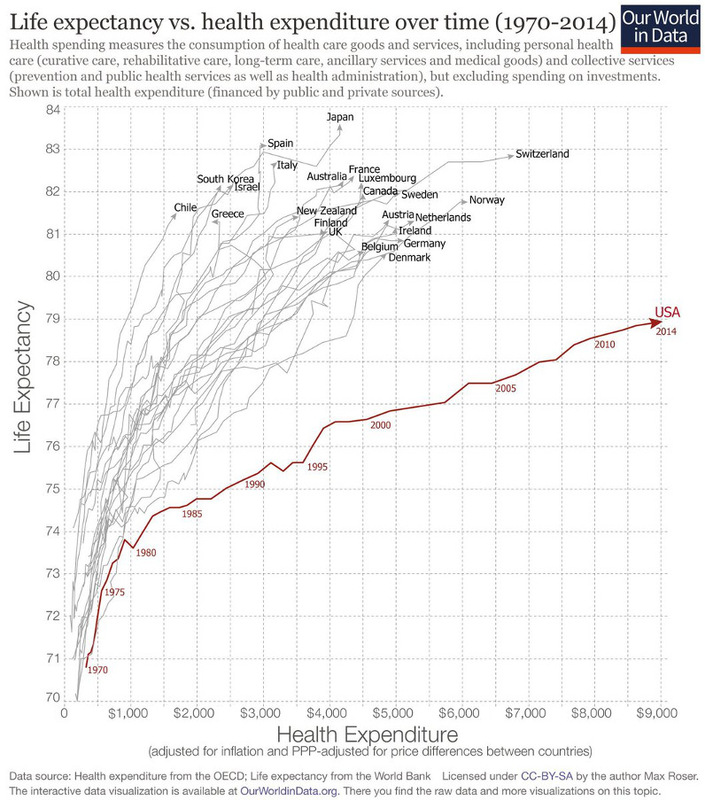 When it comes to the never-ending debate on America’s health care system, international comparisons abound. The usual point of reference is, naturally, our neighbor to the north, although France, Switzerland, and the U.K. are sometimes invoked as well (the French in particular have been consistently recognized by the WHO as having the best health care in the world). According to the most recent Bloomberg Health-Care Efficiency Index, Hong Kong has the most efficient healthcare system in the world, a position it and close runner up Singapore have held since 2009. During the same span of time, Spain and South Korea climbed up to third and fourth place respectively, with Japan dropping two places but remaining at a very respectable fifth. If you want an idea of just how absurdly unjust and inefficient the U.S. healthcare system is, read this breakdown by Seth Ackerman of Jacobin of what the average American must navigate in order to access a high-tier but vital drug. The bestselling blockbuster drug on the U.S. market is Humira, an anti-inflammatory biologic manufactured by Abbott Laboratories and approved by the FDA in 2008. Humira is classified as a “fourth-tier drug” (a cutting-edge specialty drug); it’s used for inflammatory conditions like rheumatoid arthritis and Crohn’s disease. It goes without saying that these can be awful and stressful illnesses to live with. Currently the U.S. retail price of Humira (2 syringes of 40mg/0.8ml) is around $3,500. That’s how much you’ll have to pay for the drug if you don’t have insurance. Good luck. But what if you do have insurance? (And remember, 27 million will still be left uninsured when Obamacare is fully implemented.) Well, you might be among the 15 percent of workers with employer-provided insurance whose plans nevertheless don’t cover specialty drugs at all. If so, again, you’re out of luck. Or you might be one of the 34 percent of employer-covered workers who face “co-insurance” for fourth-tier drugs, which means you’ll have to pay a certain percentage of the drug’s cost. The average co-insurance rate for these workers is 32 percent. So, absent any overriding plan provisions, the Humira would cost you $1,120. Then there are the 40 percent of covered workers whose plans charge co-payments for fourth-tier drugs, rather than co-insurance — a fixed dollar amount, rather than a percentage of the cost. The good news here is that the average copayment is $93. (Though, of course, some plans have much higher copayments.) That doesn’t sound so bad, right? Don’t get too excited, though. After all, you might be one of the 12 percent with a separate prescription drug deductible, which means you have to foot the entire bill until you reach a certain threshold. The average drug deductible is $231 per year — but, again, your mileage may vary considerably. And although your insurance will kick in once you’ve paid that much, in almost all cases you’ll still have to cough up co-payments or co-insurance. And don’t forget, you’re also paying premiums every month — $521 for single coverage on average. That’s more than 20 percent of the average wage for single, childless workers with employer insurance. And that’s not all. Almost half of employer plans that cover specialty drugs employ a variety of additional special strategies for “saying no” when it comes to fourth-tier medicines. Some have an additional cost-sharing tier for these drugs. Others impose “tight limits on the number of units administered at a single time”, or mandate “step therapies”, where they make you take cheaper treatments before they’ll pay for the expensive drug — even if your doctor is sure it’s the best one for you. Then there’s the infinite variety of “utilization management programs” that appear the instant you request such drugs: special surveillance regimes that find creative and innovative ways of making sure you don’t splurge too much on your life-saving medicine. Often these make people’s lives a living hell. Contrast this confusing, costly, and inequitable arrangement with that faced by the average French citizen, who enjoys the benefit of what many analysts identify as the world’s best healthcare system (a mix of private and public sector providers). The French equivalent of the “retail” drug price is called the prix public, or public price — the sum that Abbott is actually paid for the drug, plus sales tax. The public price of Humira in France (same dose, same strength) is not $3,500 (as it is here) but €940.90 ($1,028). In reality, though, no one in France pays even $1,028. National insurance covers, at minimum, 65 percent of the public price. Thus, the most a French patient would pay for Humira is $360. Now, that’s still a lot of money for a person of modest means. But we’re not done yet. Patients who need drugs to treat serious, chronic illnesses like diabetes, hypertension, or cancer don’t have to pay a thing. A full 6.8 percent of the French population fall into this category, and another 1.7 percent are exempted for other reasons (newborns, pregnant women, the disabled, nursing home residents, etc.). And, as it happens, rheumatoid arthritis and Crohn’s disease, two of the main chronic conditions Humira is used to treat, appear on the list of diseases that qualify for an exemption. The “no” imposed on Abbott saved French taxpayers about $2,500 per Humira prescription – the difference between the “market price” (i.e. the U.S. retail price) and the price fixed by the French Health Ministry. By comparison, the “no” handed down to you, the patient, requiring you pay 35 percent, saved taxpayers only an additional $360. By this (admittedly partial) reckoning, more than 87 percent of the taxpayer savings generated by France’s “Saying No Apparatus” (as it were) came out of the pockets of Abbott’s shareholders. Only 13 percent came out of the patient’s. This sobering tidbit is part of a much longer and somewhat meandering piece analyzing the viability of a single-payer healthcare system in the U.S., including some of the weak critiques and counter-arguments of such an approach. The whole article is well worth your time if you care about healthcare reform and want to know how and why a better alternative would work. The health sector employs more than a tenth of all U.S. workers, most of whom are working- and middle-class people who serve as human shields for those who profit most from America’s obscenely high medical prices and an epidemic of overtreatment. If you aim for the crooks responsible for bleeding us dry, you risk hitting the nurses, technicians, and orderlies they employ. This is why politicians are so quick to bash insurers while catering to the powerful hospital systems, which dictate terms to insurers and have mastered the art of gaming Medicare and Medicaid to their advantage. Whether you’re for Obamacare or against it, you can’t afford to ignore the fact that America’s hospitals have become predatory monopolies. We have to break them before they break us. What do I mean by that? Last fall, Mark Warshawsky and Andrew Biggs made a striking observation: From 1999 to 2013, the cost to employers of an average family health policy increased from $4,200 to $12,000 per year. In an alternative universe in which employer premiums had remained flat, salaries would have been $7,800 higher, a life-changing difference for most low- and middle-income families. To protect these families, many people want the government to pick up a bigger share of our hospital bills. But this just shifts the burden from employers to taxpayers. The Congressional Budget Office expects federal health spending to almost double as a share of GDP between now and 2039. With the exception of interest on the debt, all other federal spending will shrink. What this means in practice is that high medical prices charged by hospitals will gobble up taxpayer dollars that might otherwise have gone to giving poor people more cash assistance, welfare-to-work programs, and Pell grants; fixing potholes; sending missions to Mars; and who knows what else. 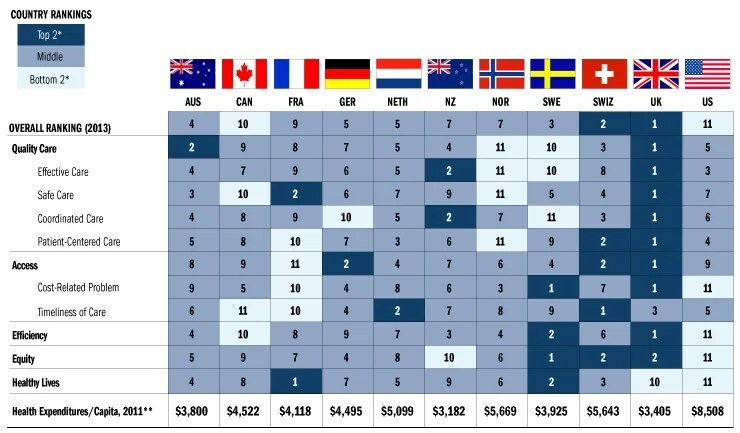 When you survey the health systems of other rich countries, you’ll find some that rely a bit more on private insurance markets than ours (like Switzerland) and others that rely a bit more on centralized bureaucracies (like Britain), but what you won’t find is a country where hospitals dare to charge such obscenely high prices. Avik Roy, a senior fellow at the Manhattan Institute and a conservative health reform guru, has observed that although the average hospital stay in the world’s rich countries is $6,222, it costs $18,142 in the U.S. Guess what? Spending three times as much doesn’t appear to yield three times the benefit. When insurers have tried to play hardball with the hospitals that gouge them, as in the 1990s, when managed-care organizations kept rising healthcare costs in check for a few short years, hospitals pressured state legislatures to enact “selective contracting” and “any willing provider” laws that impeded MCOs from steering patients to facilities where they could negotiate good rates. Moreover, MCOs can’t do much if a local hospital buys up all of the nearby medical providers. But wait a second. How is it that hospitals are also gouging Medicare? Medicare alone accounts for 20 percent of all national health expenditures, a number that, if anything, understates the extent of its influence. Shouldn’t Medicare be able to use its pricing power to get hospitals to play ball? Medicare offers standardized reimbursement rates for different services, which hospitals always insist are far too low. Yet for some routine medical procedures, the reimbursement rate is higher than the cost of performing the procedure (which, once you already have the equipment and the personnel, can be pretty low), meaning the hospital makes money off of the procedures. For other services, like giving a patient personal attention, the reimbursement rate is lower than the cost of providing the service, so this is where hospitals skimp. The unsurprising result is that we have a health system that is increasingly devoid of personal attention while at the same time generating an ever-higher volume of the medical procedures for which Medicare is willing to overcompensate. Our government can simply accept that the market power of hospitals will continue to increase while making more of an effort to force them to accept low reimbursement rates. This approach is certainly worth trying, yet it ignores the fact that because hospitals are big employers, they wield a great deal of political influence. Whenever bureaucrats try to tame hospitals, lawmakers ride to the rescue of the big medical providers. The second path is to rely on antitrust enforcement to crack down on hospital mergers and acquisitions and, more importantly in the long run, to make it easier for new medical providers to enter the business and to compete with hospitals. Naturally, hospitals hate this kind of competition, particularly from specialized providers that focus exclusively on providing one or two medical services inexpensively. To the hospitals, these providers “cherry-pick” and “cannibalize” their most profitable business lines without ever having to take on the larger burdens of running hospitals. There’s some truth to these complaints, which is why governments should compensate hospitals directly for care that it wishes to subsidize. But we need smaller, more efficient competitors to keep the big hospitals in check and to drive down medical costs for society as a whole. Curbing the power of the big hospitals isn’t a left-wing or a right-wing issue. Getting this right will make solving all of our health care woes much easier, regardless of where you fall on the wisdom of Obamacare. Let’s get to it. Indeed, everyone should have an interest in reigning in on these oligarchic and predatory practices, whether to create a freer and more cost-effective market for medical care, or to subsequently expand access to such care among the less wealthy. Granted, hospitals are but one of several factors, but judging from the data cited in this article, they are a major player. I know reports like these are a dime a dozen, especially in post-recession America, but it bears reaffirmation, if only because a fair number of Americans still seem to think that our system is vastly superior to any existing or hypothetical alternative — even though the social and economic costs are vast and growing. 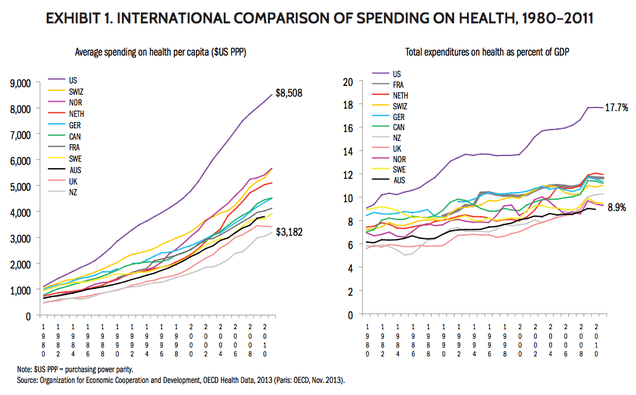 Let us start with this chart, courtesy of i09, which comes from a new report by the Commonwealth Fund, a private U.S-based foundation that promotes a more efficient healthcare. It compares the results of an extensive survey of patients and physicians across ten developed countries, looking at several relevant metrics. Notice that by all measures, the United States is either middle-of-the-road or dead last , despite spending the most per person by far — $8,508 compared runner up Norway at $5,669 (incidentally the latter also does not perform all that well). Canada, while comparatively more efficient at nearly half the cost, does not perform all that impressively either. The culprit for such inefficiency? The very fact that many Americans lack access to reliable health care (including those who are technically insured). But it’s not an intractable problem. The U.K.’s excellent result can be attributed to a number of reforms, including the hiring of more specialists, allocating bonuses to family physicians who meet quality targets, and adopting health system information that allows physicians to easily share information about their patients. Moreover, every citizen (apparently) has a doctor. Indeed, all of this attention towards the inefficiency of our healthcare system is leading to changes in both the political and private spheres. However, it will take a lot more than this piecemeal and hodgepodge approach to rectify what is very clearly a failing system. The solutions, while often difficult to implement, are clear, and both the necessary capital and public will is available. When will that be enough to spur necessary change? According to a report by the Centers for Disease Control and Prevention, 75 percent of healthcare spending — the highest in the world — goes toward aiding people with chronic conditions. In fact, almost half of American adults had at least one chronic condition as 2005. Chronic conditions — a category that includes everything from autoimmune diseases like arthritis and lupus, to obesity, heart disease, and diabetes — are not only the number one cause of death in the U.S., they’re compromising Americans’ quality of life and disabling people for long periods of time. For example, arthritis affects 20 percent of adults, and is the most common cause of disability in America. Those afflicted are projected to increase from 46 million to 67 million by 2030, and 25 million of these individuals will have limited activity as a result. Not only are Americans as a whole getting sicker, but so are young people. A 2013 report by the National Research Council and Institute of Medicine (NAC/IOM) found that “For many years, Americans have been dying at younger ages than people in almost all other high income countries.” Their data showed that women are less likely to live to age 50 if they’re born in the United States than other high income countries; in the 1980s, the U.S. was in the middle-range for survival of women to age 50 pack, but since then, not only has the U.S. fallen down in the ranking, they’ve fallen off the chart. Note that even when adjusting for race and socioeconomic status, the results are the same: rich Americans die earlier than rich people in other countries, college-educated people die earlier than college-educated people in other countries, and Americans as a whole are sicker and shorter-lived than comparable developed nations. To learn more about this issue, and some of the complex and multidimensional factors behind it, click here.